Explore, Learn, Have Fun! : A Perfect Resort close to Disney World! 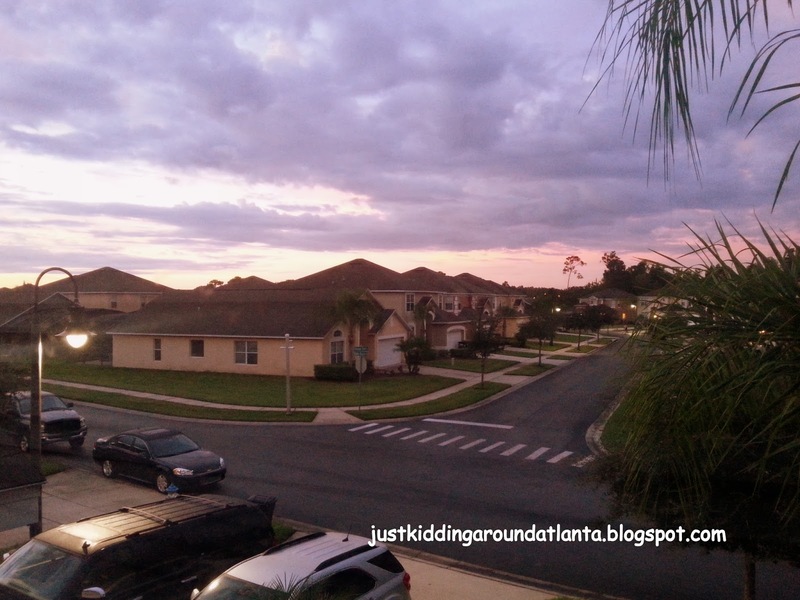 A Perfect Resort close to Disney World! 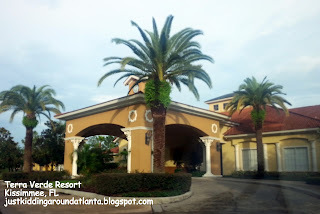 Looking for the perfect resort in the Orlando area? 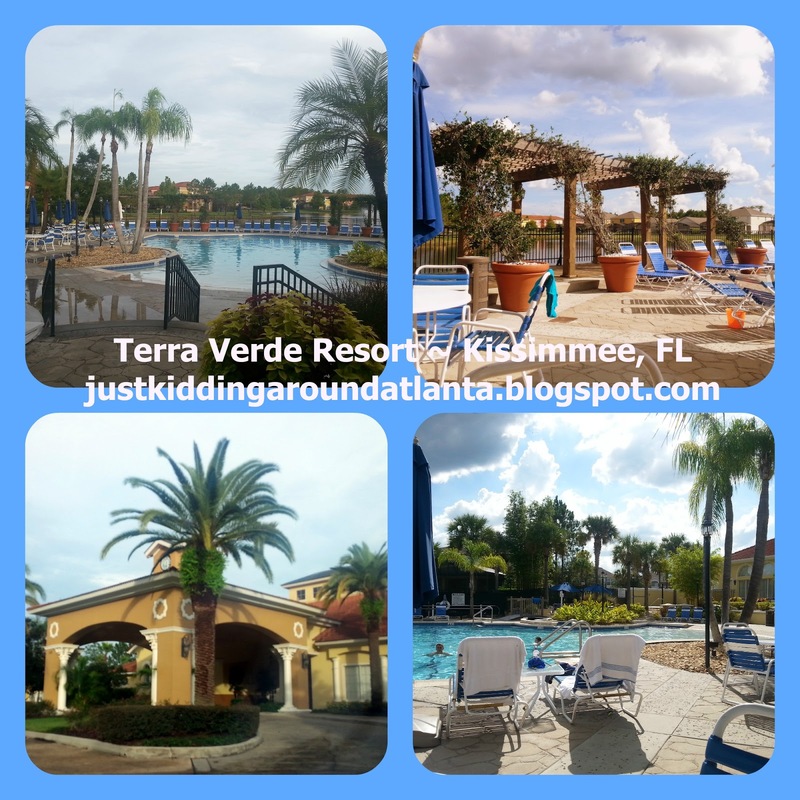 Find out more about Terra Verde Resort in Kissimmee! When planning our trip to Disney, my sister-in-law Lia and I started looking online for rental houses last winter, because we needed a large house. One with a master bedroom downstairs for my Aunt, and we also wanted a pool for the kids to enjoy. Of course we also needed to be close to the parks. We wanted to find and book a place early on so we'd know how much to budget for our lodging costs in Florida. Surprisingly, a house cost us much less than each of us getting hotel rooms, especially since we split the cost between us all. Rental homes with private pools are as cheap as $95 a night, sometimes less! Larger homes cost more, but we still paid less than $200 a night - so less than $50 per night per family! My Aunt, David & I arrived mid-day Wednesday at the resort. We had to show our confirmation email to the security guard at the front gate. He gave us a card to use to open the gates when we re-entered the resort, and we headed to the club house to check in. The staff there were very nice, and offered us a folder full of information about the area, and our rental. Aunt Anne & David in front of our rental house. We got to the house and it was on a very quiet street. The three of us took our bags inside and settled in for the next week. We had a great kitchen, so we took alot of our own food for several dinners, plus breakfasts and snacks while at the parks. That first day, we made a quick trip to Walmart for things like coffee creamer, almond milk, eggs, etc. It was about 10 minutes away - very convenient! I chose a bedroom upstairs with a queen size bed. David chose one with bunk beds. Aunt Anne had the master bedroom downstairs. There were 7 bedrooms in all, so plenty of room for our group! This house was a perfect fit for our large group (consisting of four families). Later that night Lia, her friend Jennifer, my four nieces and nephews, and Jennifer's daughter arrived at the house. The kids all picked their rooms for the stay, as did Lia and Jennifer. Since there are two master suites - one upstairs, one downstairs - this house is perfect for multiple families. I took so many pictures on this vacation - over 1000! - but not many of the house itself. 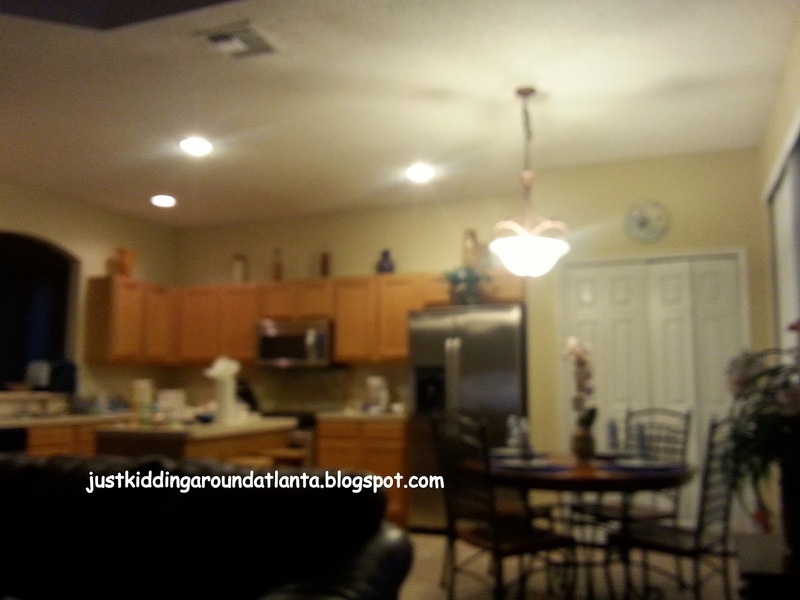 Sorry the kitchen one above is so blurry. But there are a few from the resort that I'll include here. This was the view from my bedroom the first morning - what a gorgeous sunrise, right? Like I mentioned before, we had a private (small) pool in the backyard. David was out there every single day - he loves to swim! There was a safety fence between the house and the pool to keep little ones safe. The garage of our house was converted to a game room - there was a pool table, air hockey and a comfy couch to sit on. Upstairs in one of the boys' rooms there was a Wii game system with a few games for the kids to play. The boys rooms were decorated with a Cars or Sponge Bob theme. The girls room was princess themed. 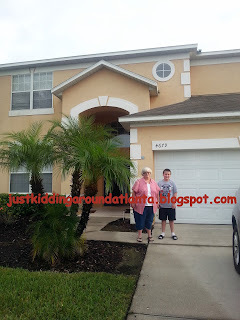 Our kids loved the house! 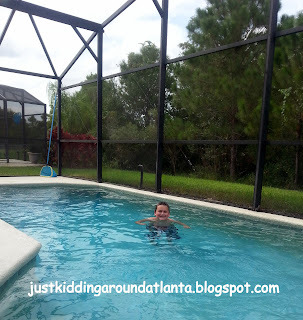 I also took David to the resort's pool several times while we are there. He LOVED it! They had a huge pool, a hot tub, a poolside bar, and more outside. Inside the clubhouse there is a nice lobby with seating, a gym, and a little arcade. They had events for guests to participate in throughout the week, as well. Being in secure, gated community (with a security guard on duty at the gate) made us all feel safe on our trip. Everyone working there was so nice, and very helpful. Sometimes you don't know if an area you will be staying in is "good" when you are going on vacation. We never felt unsafe at all here! It was in a nice part of town, close to everything we needed. Takeout/Delivery menus were in the folder provided by the resort, so one night we ordered in Chinese food. The rest of the time we either cooked, or picked something up on our way home from the parks. The kitchen was stocked with most every thing we needed to cook meals. We had plenty of towels for the bathrooms and the pool. Our house had a laundry room, so we brought our own detergent and dryer sheets. We also brought dishwashing tablets, spray cleaner for the kitchen, paper towels and toilet paper. (There were a few rolls of toilet paper provided, but no paper towels.) The house was also stocked with hotel-sized soaps in each of the three and a half bathroooms. Our house was located just a few miles off Hwy 192 which has restaurants, shops, attractions and more! So much to do, and just a few minutes away. We were about 12 minutes from the entrance to the WDW parks. It was an easy drive, and traffic wasn't bad at all, even though there was construction right outside the resort. (I am sure that is probably finished by now!) One of our favorite places we found: Abracadabra Ice Cream! We had such a wonderful time on this vacation, and I'm happy to share information about our rental home and the resort with y'all. I am not receive any compensation for sharing it - just wanted to hopefully help someone else who is planning a trip to the area! If you plan to visit the Atlantic Coast for some beach time, please check out my review of Ormond Beach's Coral Sands Inn. 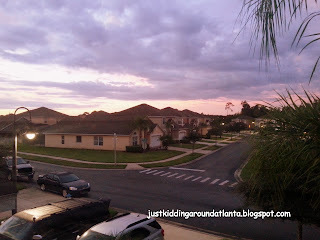 I also have a review of Orange City, which is halfway between Orlando & Daytona Beach. It is a nice place to stay if you are doing a day at the parks and a day at the beach! We will definitely look for a home in Terra Verde on our next Disney Youth Education Series trip in 2017. It will probably just be three of us next time, so we won't need a home this large. Luckily, they also have townhomes and smaller homes in Terra Verde. Have you ever rented a house on vacation? Which do you prefer: house or hotel? Let me know by leaving a comment below this post! Thanks for stopping by! Super Bowl Party? Let Pollo Tropical Cater! New Trim Healthy Mama products available!